Sorry for the "vacation" so to speak but I return to the FES with hopefully what you will find to be a much more advanced addition to my previous research on the biological effects of moonlight. In the other thread, I have a very broad scope of things underlined and there were also many advanced effects on a cellular level. I was able to research such occurences yet only had the resources and ability to test vital signs of myself and others (which I will post in the near future). However, relying on others' research for ceullar events does NOT suffice! With this thread I hope to shed some more light on the harm to metabolic processes through once again my own independent research. I hope to discuss CAM plants on a later date but I devised such an elegantly simple procedure to show the taxing results of moonlight. In the experiment such factors were put into to play so that exemption of minimal practice could be taken into account. Sunlight, artificial light imitating both celestial bodies and moonlight were used in the experiment. I only tested dicots in this instance for the uniformity is much greater in samples of given stem tissue. So much of programmed predictability, that environment influences could easily be observed. In addition to CAM plants, I would also like to discuss photoperiodicity in more detail on a later date. Goldenrods have been found to rely on flowering during a time when the day is dominated slightly by more darkness. Darkness that, without interuption will not hinder the growth of the goldenrod plant. However, it has been shown again and again that exposure to a full moon intensely illuminating the scenery with naught but minimal cloud cover, will initiate an interruption of severe consequence that in turnn, the plant will not flower. I have interesting reactions and results recorded from such events and surprising phtochrome findings. However, this was not the focus of my own experiment in this particular thread and I will now shift focus. The results showed that the structural changes observed in maize leaves were not only a response to the Cd-induced stress but also a cellular mechanism to reduce the free Cd<sup>+2</sup> in the cytoplasm. However, this mechanism seems to be efficient only up to a Cd concentration in leaves between 27 and 35mgkg<sup>−1</sup> for soils without and with liming, respectively. The cellular response varied with both the Cd concentration in soil and liming. For limed soil, Cd was preferentially accumulated in the apoplast while for unlimed soils Cd was more evenly distributed into the cells. The ability of Cd accumulation depended on the leaf tissue considered. The apoplast collenchyma presented the highest Cd concentration followed by the endodermis, perycicle, xylem, and epidermis. On the other hand, symplast Cd accumulated mainly in the endodermis, bundle sheath cells, parenchyma, and phloem. Based on the structural changes and growth reduction, the critical toxic concentration of soil Cd to maize plants is between 5 and 10mgkg<sup>−1</sup>. In many rapidly growing organs (i.e. leafstalks), the outer epidermal wall is supported by a thickened inner epidermal wall and by thick-walled subepidermal collenchyma tissue. Owing to the turgor pressure of the cells the peripheral walls are under tension, while the extensible inner tissue is under compression. As a corollary, the longitudinal tensile stress of the rigid peripheral wall is high whereas that of the internal walls is lowered. The physical stress between the tissues has been described by Sachs in 1865 as 'tissue tension'. The term 'tissue stress', however, seems to be more appropriate since it comprises both tension and compression. Hitherto no method has been developed to measure tissue stresses directly as force per unit cross-sectional area. One can demonstrate the existence of tissue stresses by separation of the tissues (splitting, peeling) and determining the resulting strain of the isolated organ fragments. Based on such experiments it has been shown that rapid growth is always accompanied by the existence of longitudinal tissue stresses. 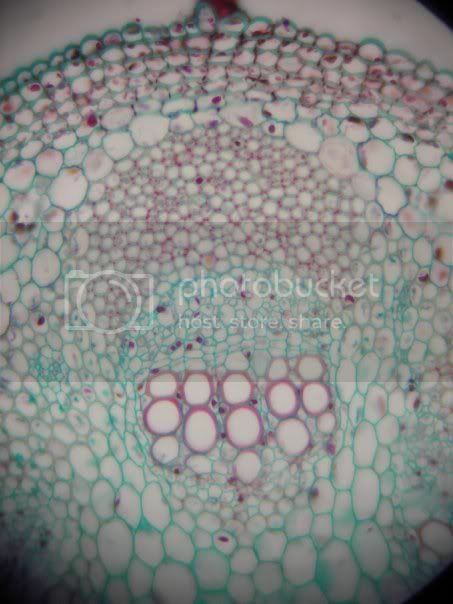 In the picture you can clearly see this is the vascular bundle of a dicot stem in this case towards perenchyma formation nearer to medulla or pith would be Amaranthus. Everything is as it should be. Clearly the vessel elements of xylem are relatively large and healthy for water transport, the band of procambium reaching across between vascular tissues also appears strong (and will eventually turn to beautiful secondary growth! ), the phloem is in good shape above the procambium and in the cortal region, scherenchyma fibers took up the red dye (L factor) and is extremely strong. The rest of the cells for the most part are the average perenchyma. Look upon the surface however, and you willl quickly see the problem. Epidermal tissue takes the outermost layer but what is below it? The key indicator is the excreted cell walls. In this plant, normal growth only yields 2 ( maybe 3) layers of collenchyma. This is made even more important since plants have such a predictable life growth and the green house used was climate controlled and protected from wind and other environment facotrs that could factor into upsetting the control. This theme was consistent throughout the 3 runs of the experiment completed and obviously shows moonlight alone results in damage to plants. Collenchyma's preciseness is also due to the large amount of energy required for the cell types production following the exodus from meristematic beginnings. This comparatively large amount of energy required to make these specific cells takes a heavy toll on the overall metabolic state of the plant. Therefore, if it can be avoided, a plant will always make as few collenchyma as possible. Cunha K, Nascimento C, Pimentel R, Ferreira C. Cellular localization of cadmium and structural changes in maize plants grown on a cadmium contaminated soil with and without liming. Journal of Hazardous Materials [serial online]. December 15, 2008;160(1):228-234. Kutsehera U. Tissue stresses in growing plant organs. Physiologia Plantarum [serial online]. September 1989;77(1):157-163. Well now, don't go thinking that I had forgotten about the role of animals! In this experiment I observed the reaction of Hydra to food. I wanted a relatively primitive animal to experiment with becuase there would be fewer chance that the evolution had put together as advanced natural defences. Well then, one might ask, why didn't I observe sponges if primitive evolutionary stages were so important? There is a very good reason. It is increasingly argued whether sponges are in fact animals. The reason being the required mobility in classification. Porifera indeed move yet only truely are independent mobile while in larval sponge state relying on cilia. As such, I picked what is slightly more advanced (not much though!) animal that would create an easily observable reaction. The cnidarians have a great reaction to food because they are in fact one of the first carnivores to arise and hence show early predatory behavior. While most cnidarians exist as polyps and medusae, the Hydra is unique in consistantly staying as a polyp for the great, great, great majority of time. Some (the majority actually) even say that they only exist as a polyp form class. The hydra has an interior gut cavity used for digestion which is interesting because of early specialization. The 2nd specialization of cells is within the cnidocyte used on the epidermis to act as a harpoon and the effective nematocyte which both are used to aquire nutrition from prey. In short, they actively stalk their food. The Hydra is completely metabolically crippled! This reactions inside of the body were so slow that no prey were able to be caught! It's usually easy pickings of smaller invertebrates among the leaves and filaments of freshwater algea and plants proved to be too much for the Hydra. 7 out of the 12 Hydra even broke down so much that their tentacles dissociated from their bodies. Those not exposed were as active as usual and ate happily! The experiment took a total of 7 days and nights. It was taken in a climate controlled green house. Temperature data should verify little change at all in environment. As it was inclosed, the space was also from of variance in stress due to wind. (No fans present in building either). Plants were divided into 5 groups of which each had 12 plants. The first was a control group left untouched other than watering and nutrition. the 2nd was subjected to only sunlight by being covered by a pot every night. The 3rd was subject to only moonlight by being covered by a pot every day. The 4th and 5th were isolated in a corner and covered broadly (from a distance though blocking all window views) by a thick screen and only subject to artificial light of a lamp. The 4th was covered with a pot during the day, the 5th during the night. The sunlight only produced the number of rows of collenchyma as the control but were reduced in thickness. The moonlight only had many more rows and the 4th and 5th had similar results to the sun only group however, the thinning was much less noticeable. The plants were developed to have functional emergent cotyledons as photosynthetic functioning rose to optimum levels prior to experimentation (grown on same timetable). Fascinating! I can't wait to read more about this. The difference in the mean values of the two groups is not great enough to reject the possibility that the difference is due to random sampling variability. There is not a statistically significant difference between the input groups (P = 0.136). The difference in the mean values of the two groups is not great enough to reject the possibility that the difference is due to random sampling variability. There is not a statistically significant difference between the input groups (P = 0.846). The difference in the mean values of the two groups is not great enough to reject the possibility that the difference is due to random sampling variability. There is not a statistically significant difference between the input groups (P = 0.130). The difference in the mean values of the two groups is not great enough to reject the possibility that the difference is due to random sampling variability. There is not a statistically significant difference between the input groups (P = 0.108). The difference in the mean values of the two groups is not great enough to reject the possibility that the difference is due to random sampling variability. There is not a statistically significant difference between the input groups (P = 0.104). The difference in the mean values of the two groups is not great enough to reject the possibility that the difference is due to random sampling variability. There is not a statistically significant difference between the input groups (P = 0.211). The difference in the mean values of the two groups is not great enough to reject the possibility that the difference is due to random sampling variability. There is not a statistically significant difference between the input groups (P = 0.204). Ichi, quite simply, you are a credit to modern science. Very well put, I await your further studies brother.